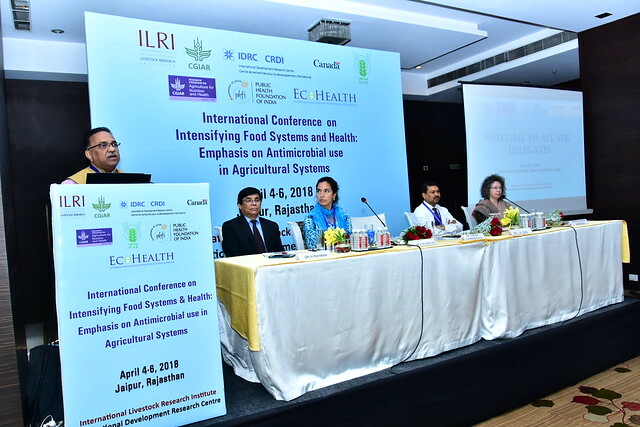 This commitment was made during an international conference on ‘Intensifying Food Systems and Health: Emphasis on Antimicrobial Use in Agricultural Systems’ held 4-6 April 2018 in Jaipur, India. 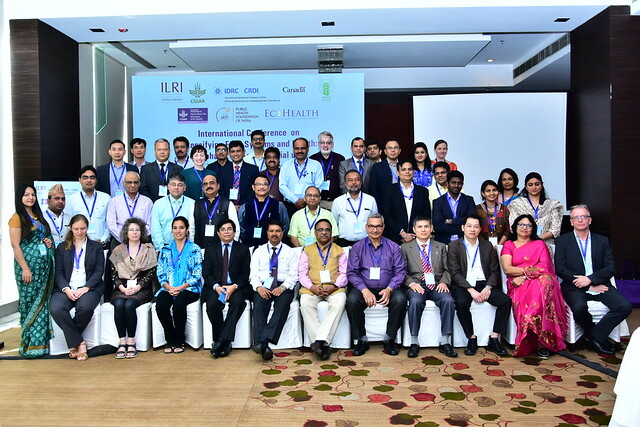 The meeting brought together over 50 experts from Bangladesh, India, Nepal, Sri Lanka and Vietnam who discussed ways of strengthening long-term partnerships around intensifying food safety systems and health research. Team photo at the conference (photo credit: ILRI/Dinesh). Antimicrobial resistance — the ability of microorganisms to adapt to medications such as antibiotics, rendering them ineffective — is a key issue globally. Antibiotics efficiency has been drastically weakened, with the emergence of some bacteria resistance and resistant genes in non-clinical environments. Although countries in South and Southeast Asia have made considerable social and economic progress, a large proportion of their populations still live in poverty. Inadequate living standards contribute to spreading the resistant pathogens and genes. 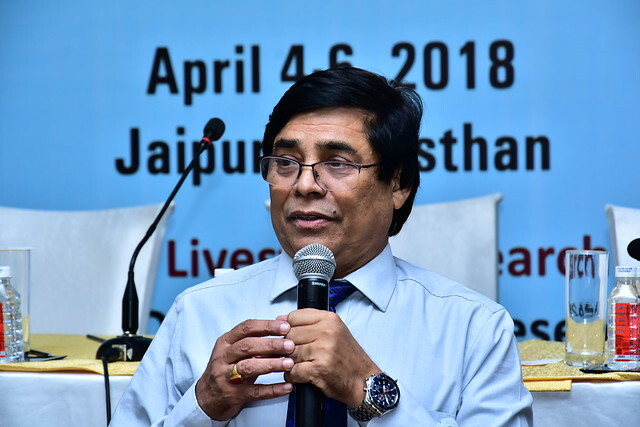 Habibar Rahman, the International Livestock Research Institute (ILRI) regional representative for South Asia said that AMR kills 700,000 people annually and causes 3.5% GDP loss globally. ‘Across the world, up to 10 million people could die as a result of ARM yearly by 2050 if no action taken, with four million people from Asia and Africa each,’ he said. In 2010, about 60,000 tonnes of antibiotics were used in animal production. This figure is forecast to reach 100,000 tonnes by 2030. Habibar Rahman, ILRI regional representative for South Asia makes an opening remark at the conference (photo credit: ILRI/Dinesh). Antimicrobial resistance is a particular risk in developing countries where it is often coupled with weak health systems and a lack of resources and technological capacity. Weak regulation of the production and sale of antibiotics, which makes antibiotics available without prescription in many countries contributes to the problem. According to Hung Nguyen, regional representative for ILRI in Southeast Asia, 90% of the antibiotics used in Vietnam are sold without prescription and dispensed by inexperienced staff. Suresh Honnappagol, Animal Husbandry Commissioner in the Department of Animal Husbandry, Dairying and Fisheries, Ministry of Agriculture of India, said One Health approaches could help in tackling AMR prevalence through multi-displinary coordination among stakeholders especially in food production systems. Suresh S. Honnappagol, Animal Husbandry Commissioner, Department of Animal Husbandary, Dairying and Fisheries, Ministry of Agriculture, makes an opening remark at the inaugural session (photo credit: ILRI/Dinesh). Experiences of managing antimicrobial resistance, antimicrobial use and food-borne diseases control in Australia, Bangladesh, Germany, India, Nepal, Sri Lanka and Vietnam were shared at the three-day conference. Delia Grace, ILRI program manager on animal and human health and J K Jena, deputy director general of animal science of the Indian Council of Agricultural Research (ICAR), said concerted, inter-sectoral collaboration would help in advancing antibiotic research in the region to come up with new treatment methods and preserve the efficacy of existing ones. Arlyne Beeche, senior program specialist from the International Development Research Centre (IDRC) expressed satisfaction for the good work done by ILRI in consultation with the Public Health Foundation of India (PHFI) and assured future support in resolving the issues of AMR in the region. Many panelists called for more investment in antibiotic research and development saying current research and development of newer antimicrobials in the region was inadequate. A greater focus on capacity development for scientists, data sharing, private sector engagement, South-South research collaboration and systematic lab-based systems were identified as key areas where the stakeholders could work together. Participants in the meeting represented governments, civil society, private sector, academia and agricultural research institutes. It was organized by ILRI, PHFI, ICAR and the International Association for Ecology and Health and funded by IDRC. Tags: AMR, IDRC, Jaipur, Rahman. Bookmark the permalink.